Until I became a professional writer ( and by that I mean, one who writes full time and actually gets paid! Yippie!) the biggest social media presence I had was on Facebook, and then it was only because my daughter was away at college and on it, and I wanted to ensure she was okay. And of course by okay I mean that I stalked her posts! She knows this so I’m not worried she’ll be mad at me. But when my first book was contracted, the publisher suggested – heavily and often! – that all their authors needed to have a very visible social media presence to garner sales and book promo, since they did relatively little in the way of book promotion. It was all on my back. If I wanted my books to sell, I had to get the word out there, so I became a social media junkie. I joined Twitter, Goodreads, Tumblr, Google+, LInkedIn, and of course I made my own Facebook author page in addition to my personal page I use for friends and family. In addition to Instagram and Snapchat. Oh, and how could I forget? My own website that I use for announcements and blogging 4-5 times per week. And with the arrival of Tribber, well, I’m there, too. Keeping these sites updated takes a lot of time… a lot of time. Let’s read that again so you get it: A LOT OF TIME. Time I could spending, well, writing! One of these days I’m going to be rich and successful enough to hire a publicist and let her take care of all the updating. Ahhh….. to dream. 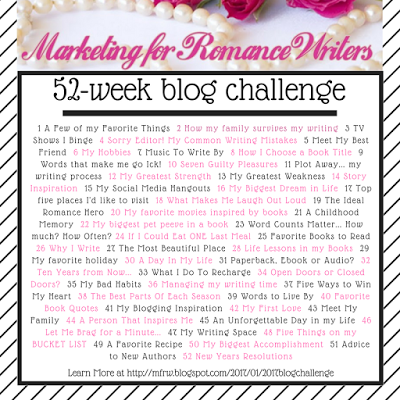 and since this is week 15 of the #MFRWauthors 52 week blog challenge, click on some of the names below and see how they’re faring with all this social media stuff. Helen Henderson – Where Do You Hangout? If you decide to follow, send me a note via Triberr and I’ll make you a member.